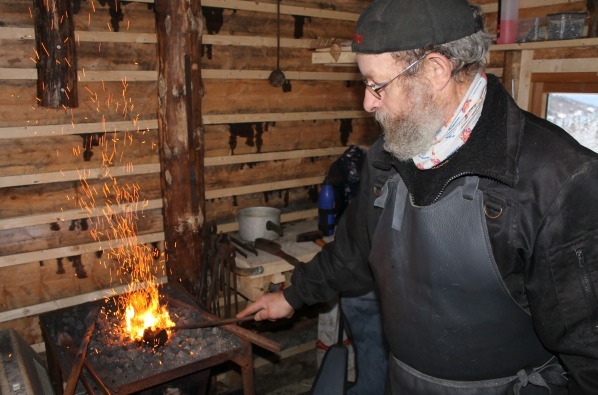 It is like a journey back in time when ThorNews meets knife smith Tor Aune at the farm near Bogen in Bindal Municipality. This is how a real knife maker should look like: With stubborn beard, fixed gaze, leather apron and leather gloves mind goes back to medieval times and reminds us that the knife smith represents an ancient craft tradition. His eyes reflect depth and wisdom when he welcomes us. We are invited into the blacksmith forge that is constructed on the foundations of an old farmhouse. The log cabin is practically furnished with a handmade forge with fan and ventilation. It is already heated, and the red-hot coke that holds up to 1600 degrees Celsius makes it feel warm inside the small house. Several knives are hung up on a row of nails and light shining through the window reveals the beautiful nuances of polished knife handles and scabbards. We ask for how long the knife maker has made knives, and he answers ‘about five to six years’. Observing the elaborate products – we do not believe him. There is nothing that looks like the work of an amateur but a professional who really knows what he is doing. It is easy to see quality handles, blades and scabbards – and each knife rests comfortably in the hand. The conversation reveals that Aune made his first knife in the 1980’s, but says that it was so much work that he told himself: – Never again! In the 90’s he bought the book ‘The Knife Smith’ which was both a source of inspiration and guidance. After he quit farming, much time was spent making knives. 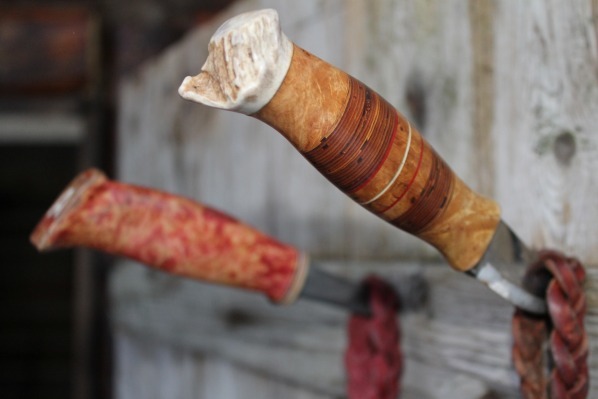 The knife smith is very concerned about the knife’s function throughout history – both as a tool and ornament – but emphasizes that the knives primarily are designed to be used for hunting, fishing and work. – The design is carefully thought through – but most importantly – functionality comes first, Aune says. All the knives are self-made –including blades, shafts and scabbards. 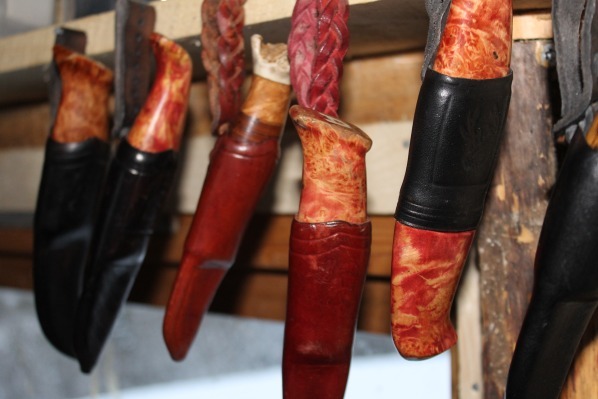 In addition to horns of elk and deer, the knife maker is searching the woods for raw materials making shafts. Bark and so-called ‘rilkule’ from birch is used in production – strong materials that are great to work with. Aune makes the shafts by hand and is very detail oriented. He has an emphasis on aesthetics and ergonomics, and the master tells that every knife is unique. – I follow no template, Aune says that so far has made about a hundred different knives. The blacksmith hammers and forms the steel blade. He uses an angle iron and welds and turns a 3-ply blade with carbon steel that has the best ability to be sharp. 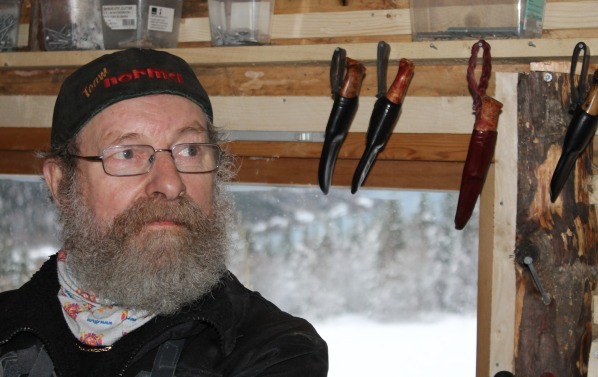 – A knife is a special tool that is attractive to hunters, says Aune who himself is a hunter. 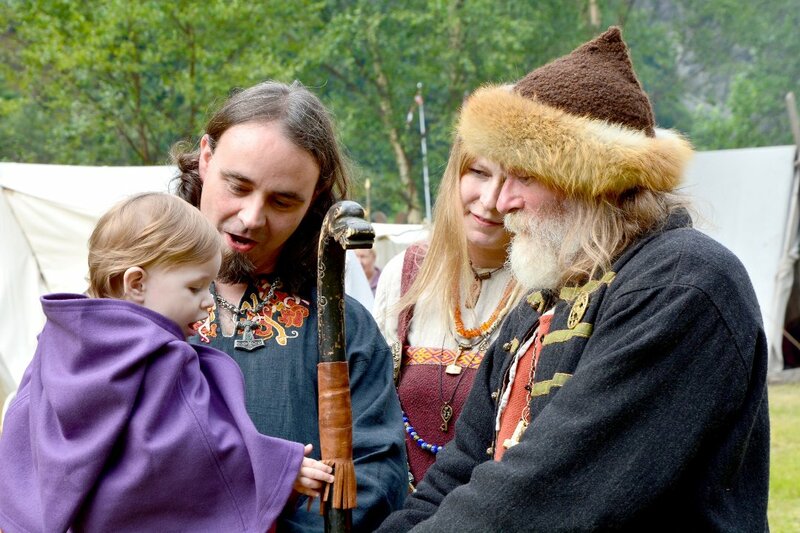 – The hunting communities often stick to traditional methods and tools. Lately, he has begun to forge so-called ‘Damascus blades’ which consists of up to 260 layers, and takes about five days to forge. A pattern resembling tree rings is reflected in the metal, and the blade gets very strong and sharp as a razor. Also all the scabbards are self-made. Some are made of birch, but most often ‘Masur leather’ is used, which is tanned leather from cattle. To get the right fit, you must soak the leather, form, stitch, and dry it. The scabbards are carefully adjusted so the knives stay in place. It only takes millimeters before a scabbard is useless. The whole process from grinding to completion takes many days and the knife smith says that purchasing a good knife is a lifetime investment. Aune encourages people to use the knife and tells that his customers are men between 17 and 70 years old. The knife maker calls for interest from the ladies. – No woman has yet bought a knife made by me. Aune is concerned that each knife get its ‘rightful owner’ and that he combines his own experience with customer requirements. It is mostly local people who are customers, but he knows for sure that one of his knives has ended up in Denmark. When ThorNews asks if he would be willing to adopt an intern with an interest in the field the knife smith answers that he will do so with great pleasure. – It is important to new generations to carry on the tradition.